A twitter conversation a few days back re-sparked my interest in the enganche role within a strikerless formation. The actual conversation focussed on player roles we wanted in FM15. I opted for the Withdrawn Targetman, which is basically the role I want my Targetganche to fill right now. Basically, we wanted a cross-pollination of the targetman role and the enganche role. In a way, it makes sense, as the enganche already encorporates some of the qualities a targetman is supposed to offer to a team. Mix up the enganche and the targetman and ideally you get the Targetganche™, or the Withdrawn Targetman I want to see in the game. He will hold up the ball and bring his team-mates into play, choosing how and when to pass the ball to maximise the potential of the attacking movement. Because he was supposed to be my Plan B, he would have to offer some physical brutality as well as footballing skills. In an ideal situation, I would be able to tweak the current enganche role to my likings. Unfortunately, I was unable to make the Targetganche hold up the ball as much as I would like to. Basically, the Targetganche showed two dimensions in his style of play. 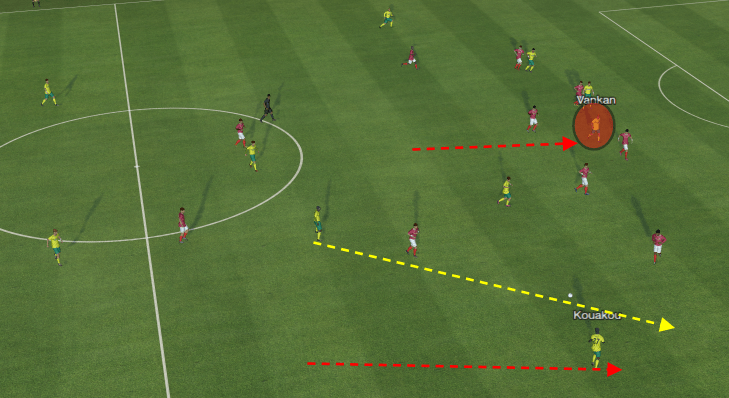 The first dimension means the Targetganche often takes a touch before quickly passing the ball along, instead of holding it up to ensure players link up or move into advanced positions. In a match, it would look a little something like this. It looks like a fine goal and the Targetganche really plays an important role in the whole attack, setting it up from midfield and ending the attack with the assist for the goal-scorer. When you break down the move, it shows you the beauty of strikerless football as well as why I’d love the Withdrawn Targetman to be an actual new role in FM15. In the initial stage of the attack, Targetganche Vankan, highlighted in red, plays as a proper targetman, his back being towards the goal and he has actually dropped back into attacking midfield, whilst the two flanking Shadow Strikers, highlighted in blue, have taken up advanced positions, one of them even in an off-side position beyond the AZ defensive line. In an ideal situation, the Targetganche can hold up the ball to have the players take up attacking positions, before flicking the ball on towards the Shadow Strikers. Sadly, despite being asked to play risky passes, Vankan swivels and looks for a short option. 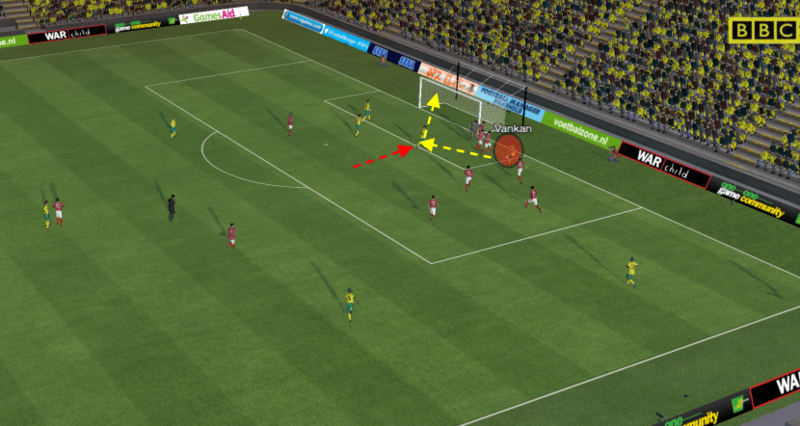 Vankan swivels on the ball and plays a short pass towards one of the central midfielders, Jankovic. The Shadow Strikers are still in advanced positions, even though they have clustered together on the left side of the attack. 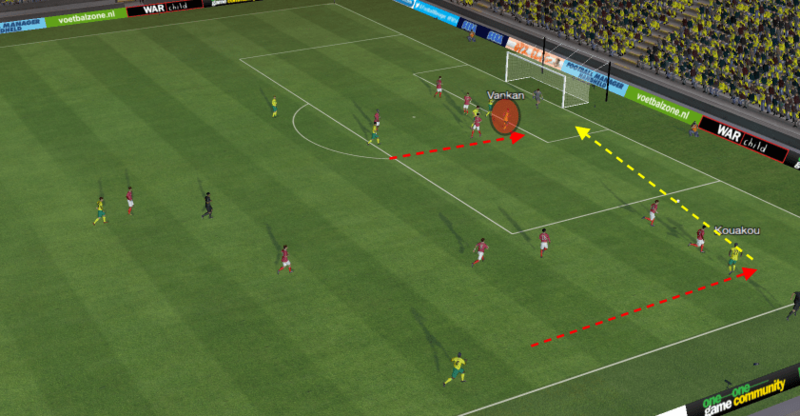 Towards the bottom of that screenshot, you can see the right wing-back making a threatening run forward. Jankovic passes the ball back to Vagner, who indeed recognises the run made by the right wing-back and plays the ball towards Kouakou. Vankan meanwhile is unmarked by opposing players and takes up a position near the edge of the box, looking to support the two Shadow Strikers. As Kouakou surges past an opponent, the Shadow Strikers take up advanced forward positions, with the Enganche remaining behind them and indeed being overtaken by the Central Winger linking up. 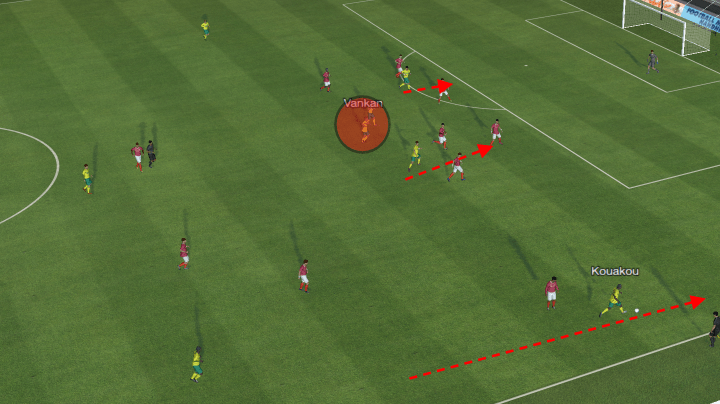 Effectively, our four players are drawing the AZ defence close together, which means that a well-timed run can send a player clear of defence with no chance of recovery by a wide defender cutting inside. Kouakou’s run leads him to the back-line and draws out two defenders. With the defenders focussing on the advanced forwards, the Shadow Strikers, no-one is actually paying attention to the Targetganche. Vankan surges past the defenders to connect with the low, driven cross by Kouakou. Making a run from the edge of the box, sees the Targetganche unmarked near the first post. The cross comes in low and Vankan again swivels on the ball before laying it back for the onrushing Shadow Striker to tap into the back of the net. Whilst it’s hardly the way I actually wanted the Targetganche to play, it certainly does work against a team like AZ, where the opposition drops back and offers little or no space to actually exploit. Oddly enough, the Targetganche seems to perform better as a mobile threat, connecting with crosses than as the actual bulky powerhouse, chesting down passes or flicking them on. In terms of actually holding up the ball, the Targetganche doesn’t really do it, instead taking only one or two touches before quickly passing the ball along. 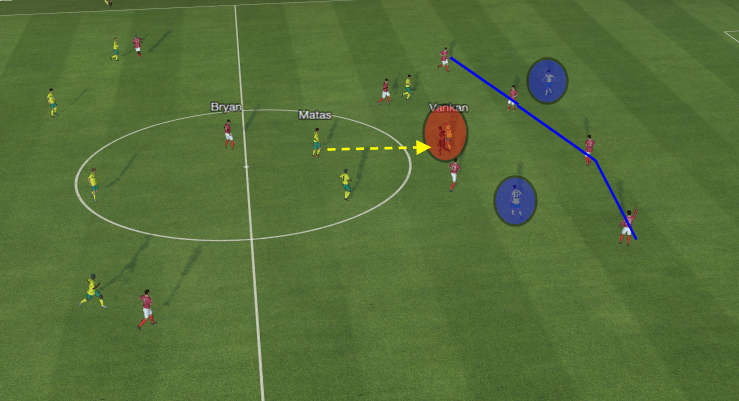 Oddly enough, I’ve seen the actual Targetganche motions most in matches where the opposition pushes up and tries to actively fight us off, which is strange considering the fact that I wanted a role like this to break down stubborn defences all pouring into their own box. In the above video you can see the Targetganche play in the way I actually want him to play, the second dimension to his style of play. 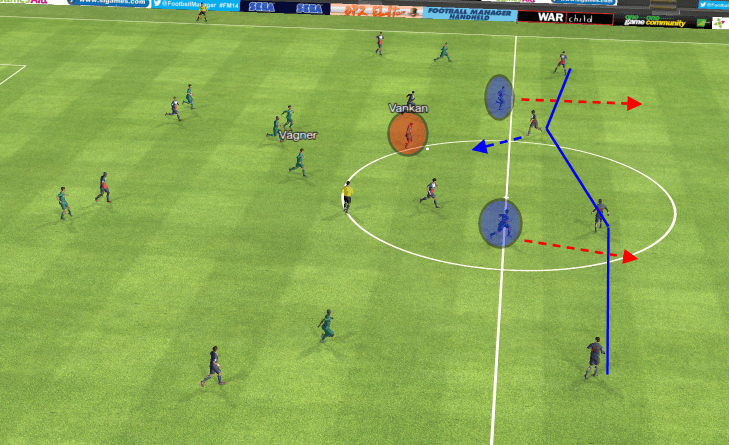 In the initial stages of the attack, the Targetganche, highlighted in red, takes up a more advanced position compard to the two Shadow Strikers, highlighted in blue. 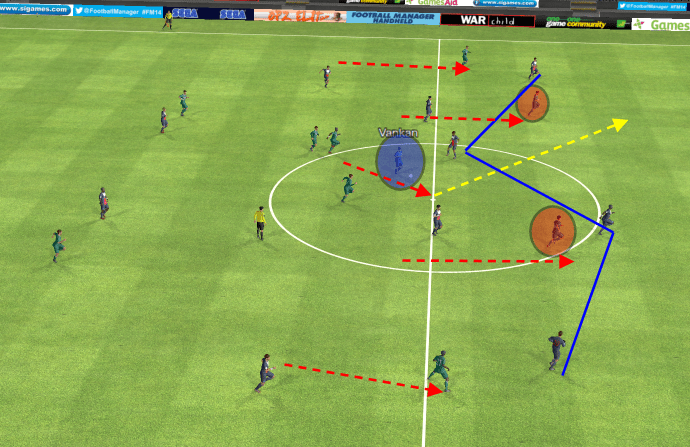 The Shadow Strikers try to contribute defensively by dropping deep, keeping up with opposing players who are pushing forward. The Targetganche is the advanced attacking focal point for the initial stages of the attack, looking to play in his team-mates. As Matas wins the ball, Vankan takes up position with his back to goal, whilst the Shadow Strikers are preparing to make their runs forward. 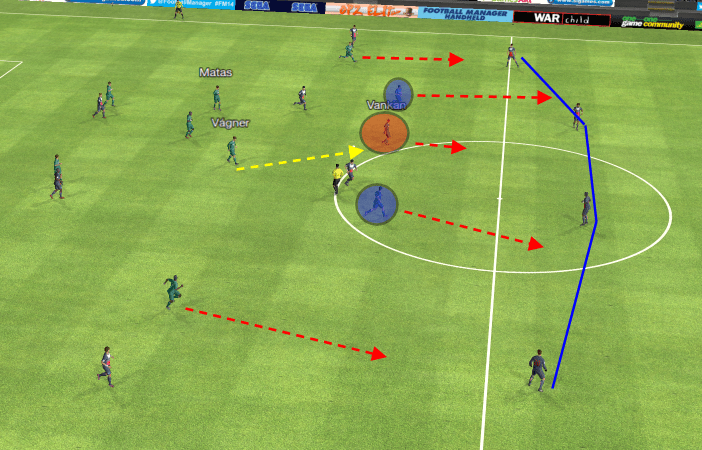 A few easy passes will see Vankan in possession, at which point he can set up the attack. The movements by the Shadow Strikers also help to relieve the amount of pressure on the Targetganche, as defenders seem more likely to pick up runners instead of more static players. With the movement of the Shadow Strikers and wing-backs, the opposing defence remains stretched. 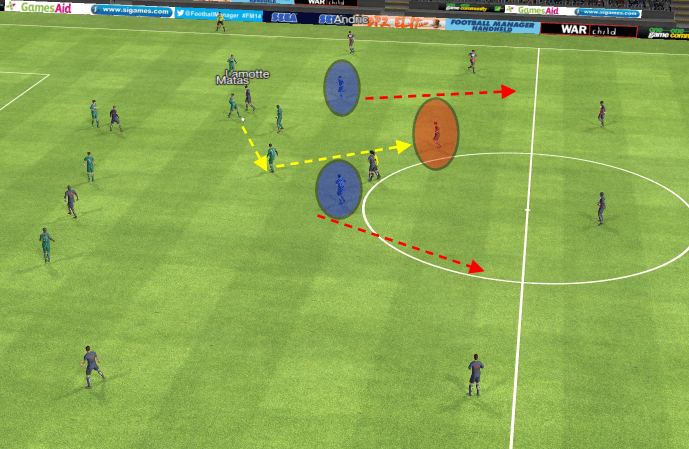 The two centre-backs are supposed to pick up the Shadow Strikers, whilst the wing-backs are supposed to pick up the runs of their counter-parts. 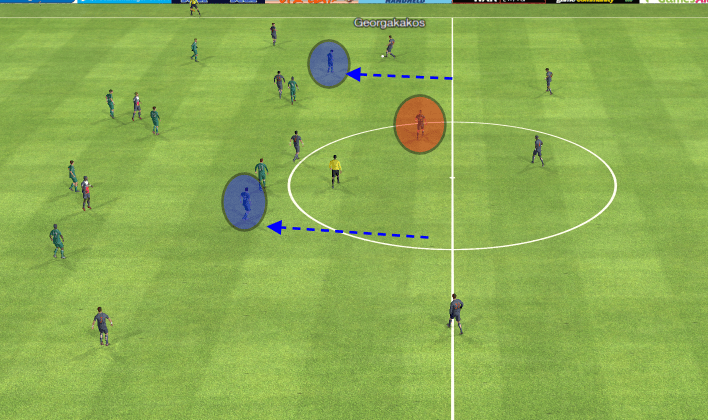 This means the defensive line has to stay wide, allowing for gaps in the defence. When the wing-backs would cut inside to help the central defenders, they would cede the wings, allowing our wing-backs to dominate the flanks. In this case, Vankan actually does hold up the ball and he dribbles forward. 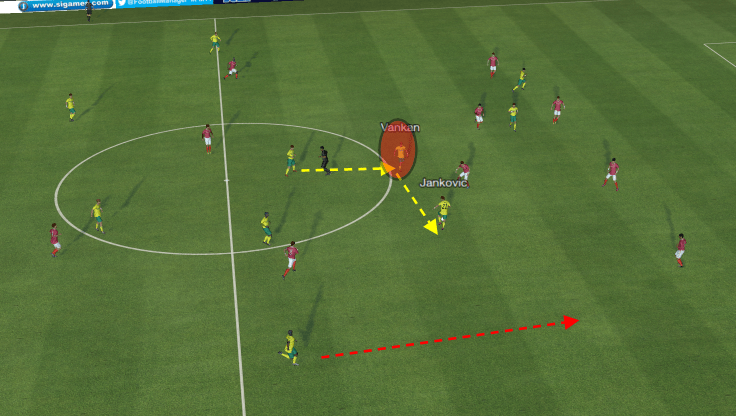 One of the central defenders actually steps out to take on Vankan, allowing the Shadow Striker space to move away, effectively breaking the defensive line. Because the defence is stretched by our own wing-backs, there is no-one in the direct vacinity to cover the run by the Shadow Striker. Vankan keeps hold of the ball long enough to allow the defender to step out quite far, allowing the Shadow Striker a lot of time to make his run into space. Just before Vankan actually gets pressured, he can release an easy through-ball into space for the Shadow Striker to pounce upon. Interesting article. I m from Indonesia. * why you choose Eg. Not Treq/AP. Did you decide to have Eg in that pos because you played with 2 SSs (positioned in narrow form), so you think theres no need to have a roaming player like Treq. An AP should be ok in this shape, im sure. Just see how it fits with 2 CMs behind. * the 2 CMs seemed to be high up on pitch. Did you set them to Attack or maybe automatic duty in Attacking Mentality? Or anything else that i missed something here. * i difference between treq and Eg, is you can instruct to Eg to close down more. So, Ill someday try it 2 see my Eg as the most advanced on pitch. Have you ever tried this before? Any thought of this?